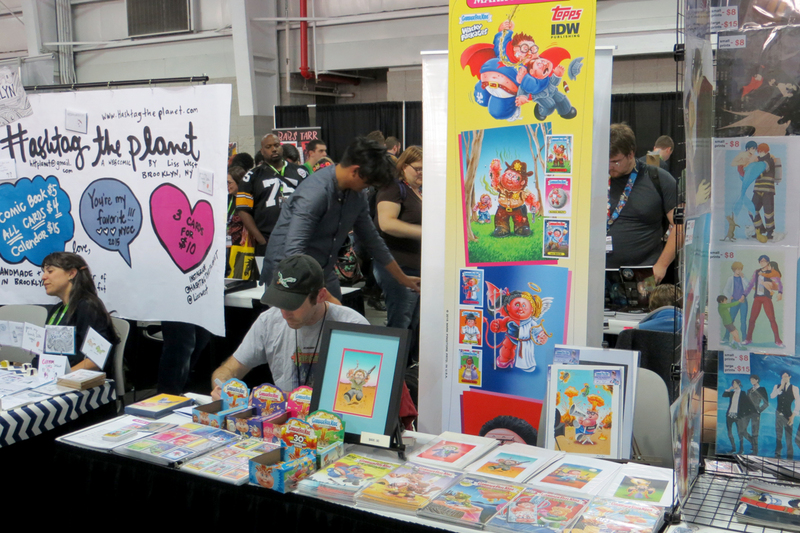 New York Comic Con has morphed into a pop culture phenomenon. Mobs of eager fans flow through the venue, consuming every element of entertainment. Every recognizable brand, every superhero, is represented. It's a wild, pop culture safari where herds of fans roam the land. Only a mere 4 or 5 years ago, TMNT was an endangered species. The Heroes in a Halfshell were a dying breed. But, things changed. The property became protected by Nickelodeon. 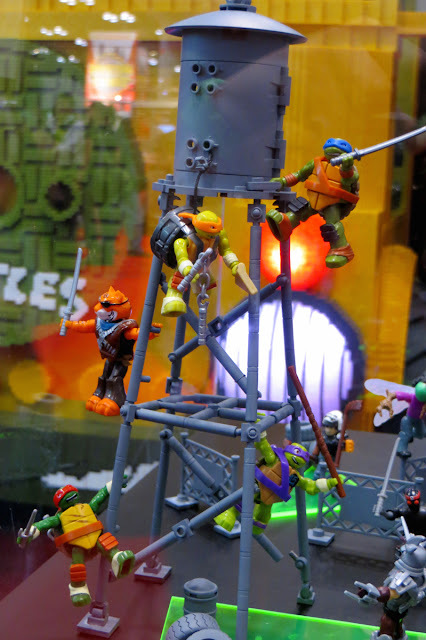 The almost-extinct TMNT have risen up from the sewers and now are an unstoppable force in the Comic Con kingdom. This year, Turtle Power was everywhere. 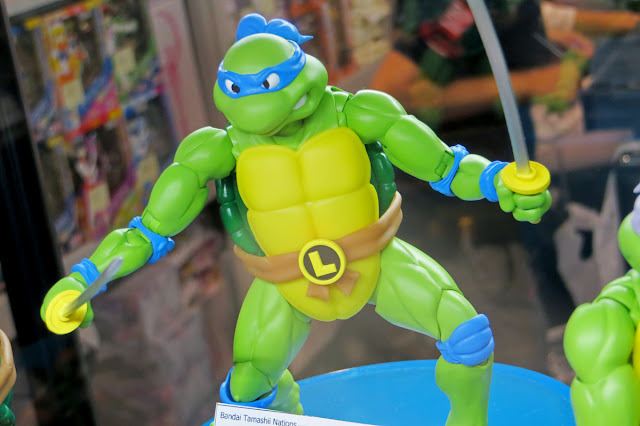 The cowabunga coverage in PART 2 highlights the showroom floor & Artist Alley. 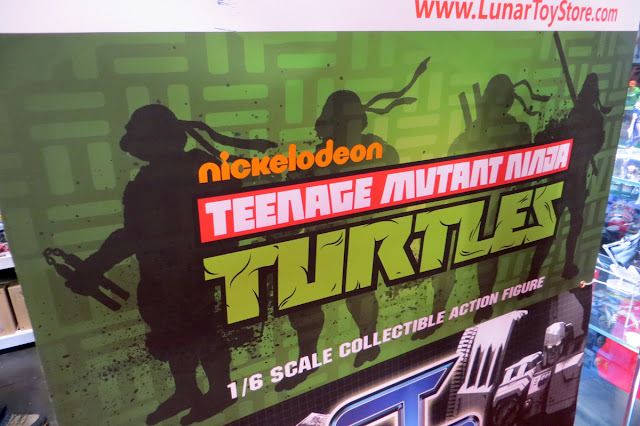 For the TMNT panel, autographs & Nickelodeon booth, check out PART 1. What were the best TMNT moments? 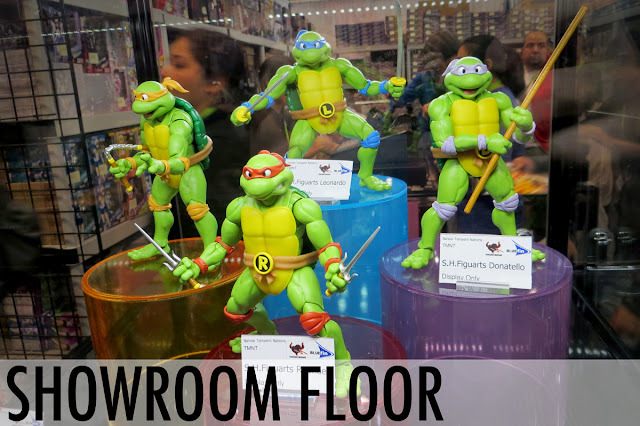 Strolling across the showroom floor, TMNT was everywhere. From vintage merchandise to upcoming releases, the place was heavenly. DREAMEX. Bodacious times awaited at the Lunar Toy Store booth. A TMNT banner welcomed guests as they entered. I weaseled inside to scope out what they had on hand. 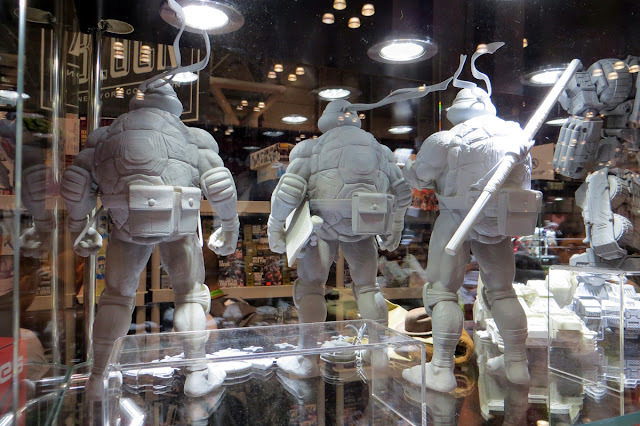 TMNT prototypes from DreamEX! The 1/6 scale figures were grabbing eyeballs from all over the showroom floor. 3 of the 4 Turtles were on display (Donatello, Michelangelo & Donatello - Leonardo is mysteriously absent). The design is different than the recent efforts we've seen from other companies. 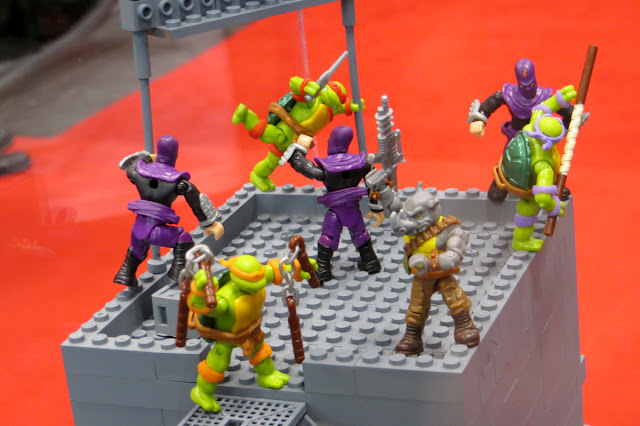 The figures don't seem to be from a distinct era of TMNT. Instead, it's more of a stylized mash-up showcasing each Turtle's distinct personality. The level of detail is top notch. From bandanna to shell, the unpainted sculpts are already a work of art. I also dig that each character also has a pouch resting from their belt - a look not typically seen on other TMNT figures. As cool as the figures are, the accessories are the real selling point. There's an original cartoon-styled communicator, grappling hook, throwing stars, and an 8-slice pizza pie. 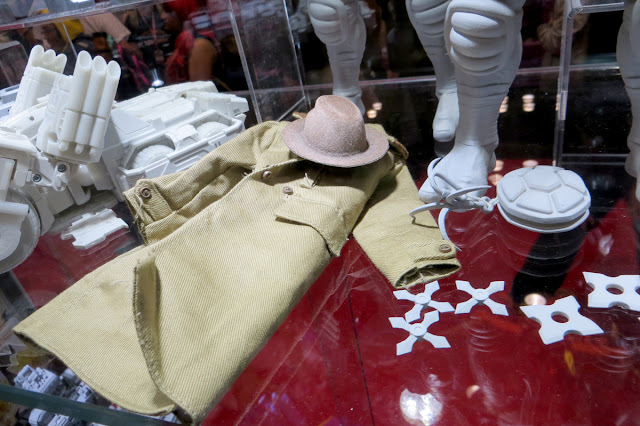 The best of accessory is, hands down, the signature trench coat and hat. These accent pieces are long overdue for a revival in the action figure realm. My enthusiasm for Turtles in trench coats has surfaced on The Sewer Den before, so thank you DreamEx for fueling my passion even further. FIRST GOKIN SHREDDER. 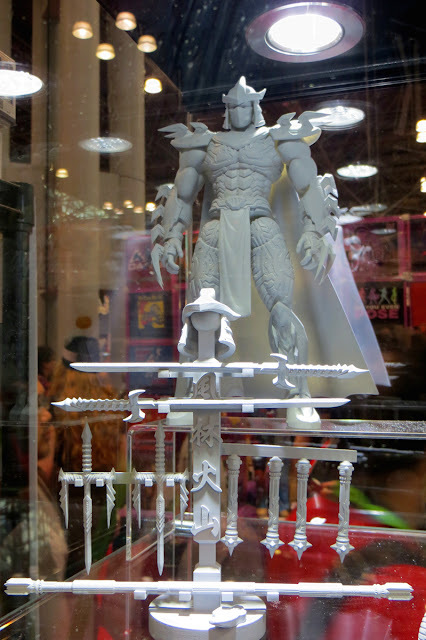 The Lunar Toy Store booth also had a First Gokin Shredder prototype on display. Even behind glass, this figure was menacing. From the intimating armor to threatening body language, the evil attention to detail is impeccable. If he weren't scary enough, Shredder also includes an expansive collection of weaponry. Dust of your shelves, you might want to find space for this guy. S.H. FIGURARTS. People casually strolling the showroom floor easily got sucked into the S.H. 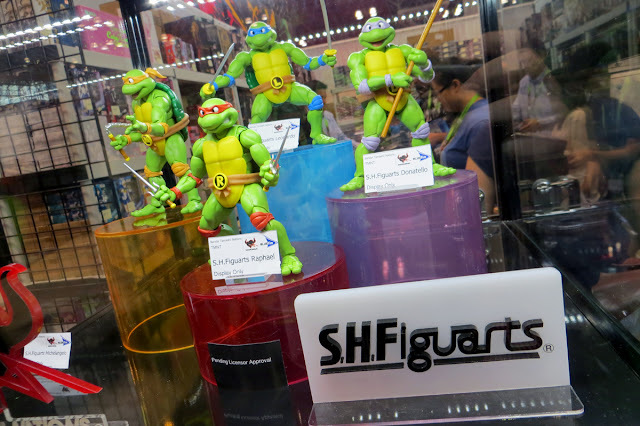 Figuarts booth. Based off the classic cartoon, their upcoming figures were hard to miss. When I originally saw photos of these guys, I was skeptical. Another set of classic cartoon figures? Do we really need more? But when I saw them in person, my skepticism mutated into excitement. These dudes look even better close-up. The quality design is extremely captivating. I got lost staring at the alluring green plastic. I had to force myself away. 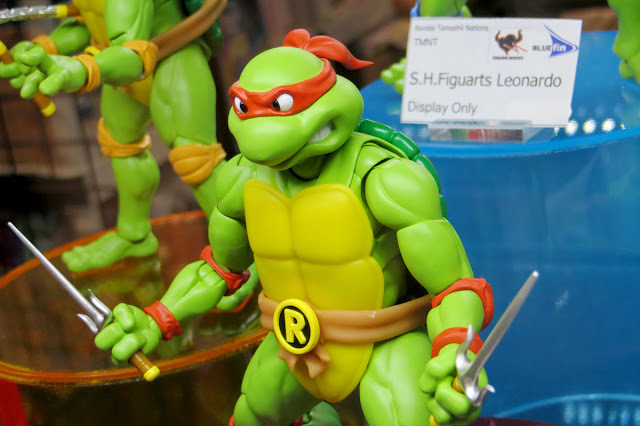 There have been many attempts of the years, but no company has successfully released TMNT figures that look identical to the original cartoon. Will S.H. Figuarts be the first? MEGA BLOKS. Lego gave us a handful of TMNT sets over the last few years, but that era is now over. Mega Bloks will soon be releasing building sets of our favorite heroes. Can they top Lego? From what they had on display, they're coming out of the sewer swinging. 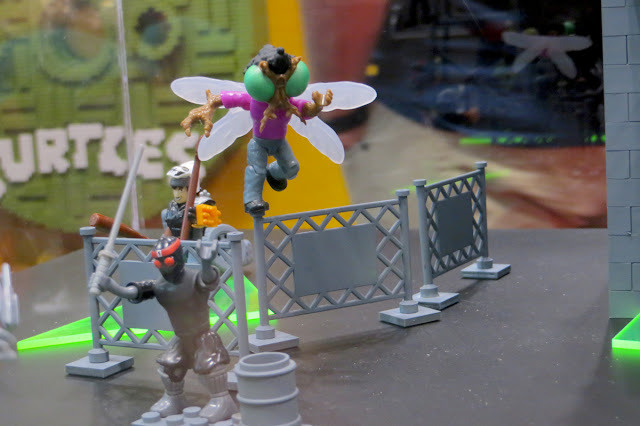 There will be 4 series of TMNT Mega Bloks. 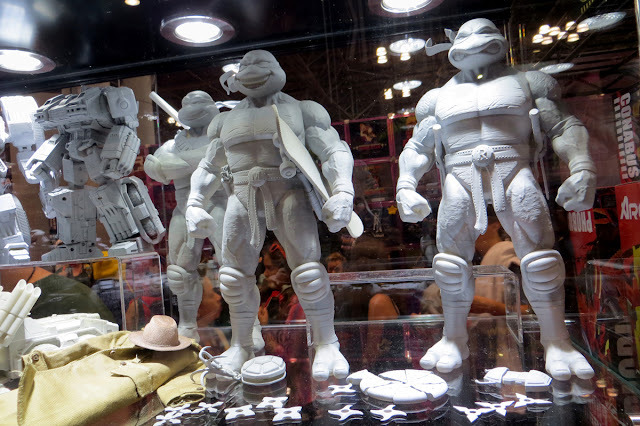 Almost every fan from every era of TMNT will be happy. Adult collectors can look forward to the classic collection. Iconic characters such as Rocksteady & Bebop will get the mini-figure treatment. I especially loved the tiny Foot Soldiers. The robotic bozos haven't got enough love and I'm happy to see a set including them coming into existence. Next up, the Nickelodeon series. The current cartoon hit will appeal to both kids and adults. The sets themselves already look like a success to me. Aside from their mini-figures, I was never impressed with Lego's offerings. The sets felt so generic - nothing about them screamed "cowabunga!" 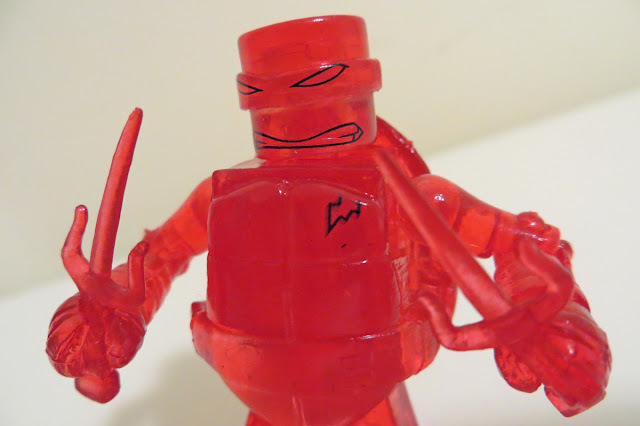 However, Mega Bloks has crafted something that genuinely feels a part of the TMNT universe. Warehouses & water towers? Yes, these are the sets we've been clamoring for. Not on display was a line that will be based off the next upcoming film. Who cares about that when there's a GIANT Party Wagon made of Mega Bloks on display?! I'm a sucker for goofy photo opps. Don't judge me. DIAMOND SELECT TOYS. Everyone loves free swag. Leaving a con without a freebie gives a sense of defeat. Luckily, the fine folks at the DST booth came to everyone's rescue. 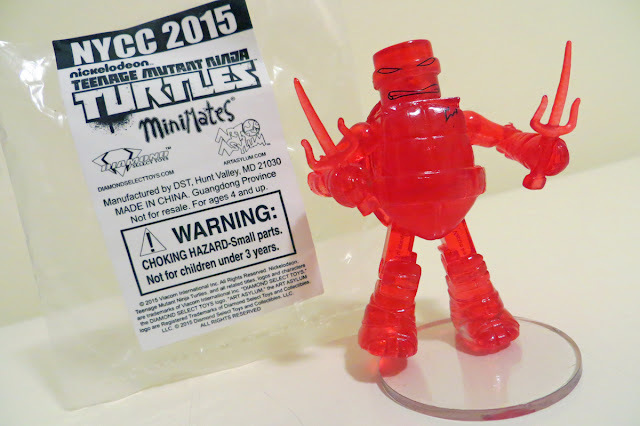 I marched over to their spot determined to take home a prize - a NYCC-exclusive, translucent red Raphael Mini-Mate! A freebie doesn't get any better than this lil dude. He boasts bright colors, includes weapons, and even has a stand to prop him up. Mini-mate, mini-awesome. Where do you go to find insane amounts of skilled artists? 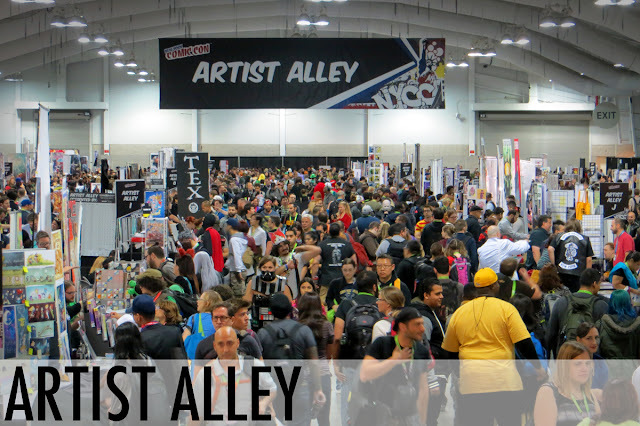 Artist Alley - an enormous space lined with unprecedented talent showcasing a collection of work. Time is lost in this room as you drift from table to table studying each piece in awe. There are so many beloved pop culture characters on display, including the Turtles. It's difficult to select an artist that deserves your hard-earned cash - there are just so many! 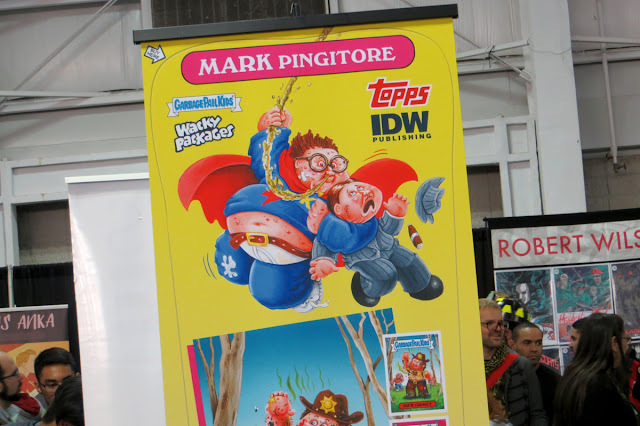 After much scrutinizing, I hunkered down with Mark Pingitore. 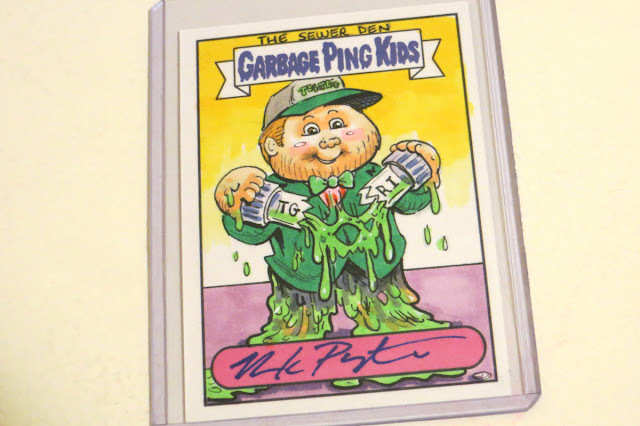 The man is partly responsible for the Garbage Pail Kids revival. 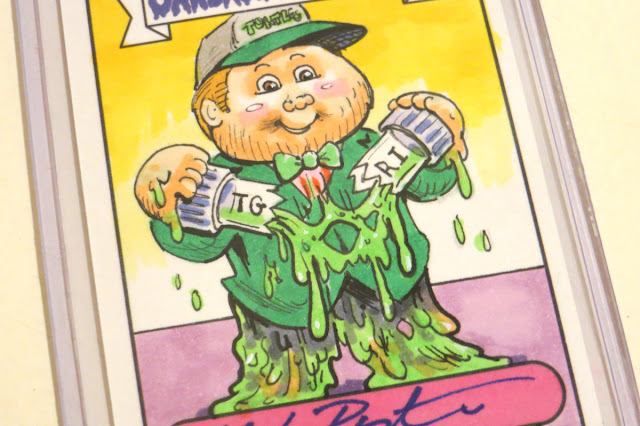 He has illustrated over 40 card fronts as well as work for other trading card series, such as Wacky Packages, Hollywood Zombies, Mars Attacks, and Cereal Killers. Immediately, I knew what needed to be done. I plunked down my cash and had him commission a filthy, original piece commemorating The Sewer Den. Hours later after much anticipation, I returned to Mark's table full of enthusiasm and intrigue. The event was coming to a close. He pushed my custom-Sewer Den creation across the table with a touch of mystery. He removed his hand and revealed the me-inspired piece. The man did not disappoint. Dare I say, cowabunga?! The Sewer Den's Garbage Pail Kids-inspired artwork is pure perfection. Mark did a fantastic job capturing my likeness and Turtle-Powered spirit. It literally oozes in sewer-style! Getting this was the last item on my itinerary, on my last day of the event. It couldn't have ended any better. I like to think that the artistic memento acted as a swan song to my NYCC adventure. 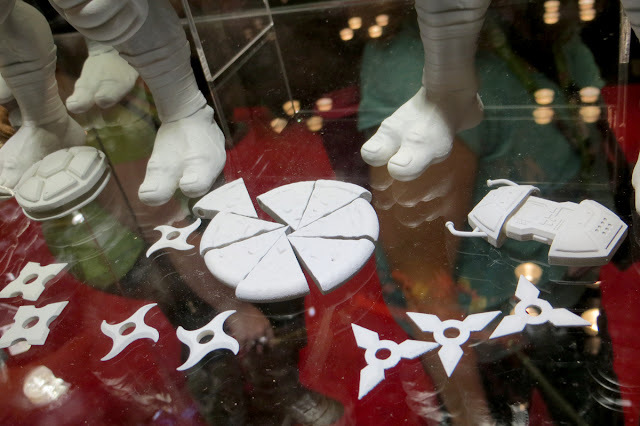 TMNT took New York Comic Con by storm. By the end, the event was bleeding green. 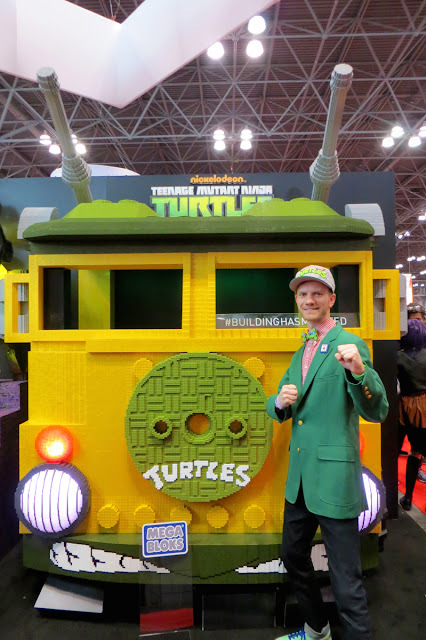 From the engaging panels to the slew of visual curiosities on the showroom floor, Turtle Power was unavoidable. Luckily, cowabunga-overload is impossible. And if you missed out on the fun, don't sweat it. There's always next year (I'll be the oozy dude in the green jacket and dorky bow tie). See ya there! 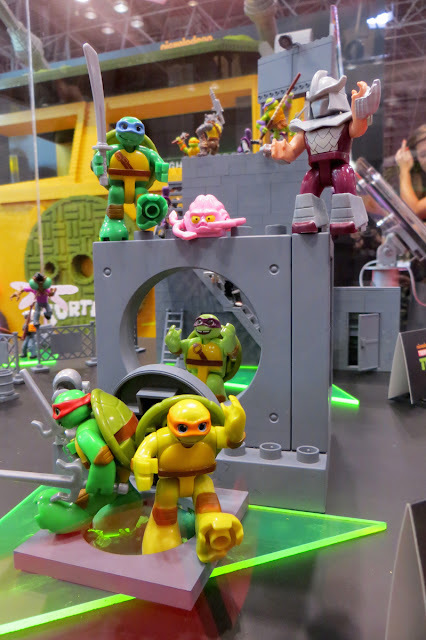 Gotta say, those new Mega Bloks retro TMNT sets are going to be KILLER. Yeah! I'm really loving the cartoon Foot Soldiers in true form. Hopefully, there's even more mutants they haven't revealed. I like this place. I was here the other night, I've been there for about four or five hours and found the prices reasonable on all fronts and the staff to be so friendly. I would be the perfect person to have on an infomercial for these venues in San Francisco if they ever had one.